New York (CNN) – A new CNN/Opinion Research Corporation poll out Monday indicates that slightly more than a third of teens personally have been subjected to bullying behavior. In the poll, more than two-thirds of teens also said their friends about been bullied. Yet a majority of adults believe bullying is a minor problem or not a problem at all, according to the poll. Slightly more than a third – 37 percent – of teens have been ridiculed, humiliated, or verbally or physically threatened by another child, either in person or online, according to the poll. A total of 68 percent of teens polled said their friends had been subjected to such treatment with 13 percent of teens saying most of their friends have been ridiculed, humiliated, or verbally or physically threatened by another child, either in person or online, another 13 percent saying some of their friends had been subjected to such treatment and 42 percent saying only a few of their friends about being on the receiving end of bullying behavior. Twenty-nine percent of teens said none of their friends had been subjected to bullying behavior. And when asked how most of the children they know react when a fight breaks out at school or at a social event, 19 percent of teens said their acquaintances try to stop the fight and 23 percent said other kids try to find an adult. Another 34 percent of teens responded that their acquaintances take no steps to stop the fight and 19 percent said the children they know encourage a fight to continue. While the new poll indicates that bullying is a problem in the lives of teens, it also suggests that adults have conflicting views about bullying. When asked about the children who live in their neighborhoods, a total of 66 percent of the adults surveyed said those children have been ridiculed, humiliated, or verbally or physically threatened by another child, either in person or online. Twenty-one percent of adults said most children in their neighborhoods had been subjected to such behavior, 22 percent said some children had been and 23 percent of adults said only a few children had been. Nineteen percent of adults polled said none of the children in their neighborhoods had been subjected to bullying behavior. A bare majority— 51 percent – of adults surveyed said bullying was a minor problem in schools in their neighborhoods and another 14 percent said bullying was not a problem at all. Thirty percent of adults polled said bullying was a major problem in schools in their neighborhoods. But when asked whether bullying is a serious problem that adults should try to stop whenever possible or, alternatively, whether learning how to deal with bullies is a part of growing up and that adults should let children handle bullies on their own, 77 percent of adults surveyed said bullying is a serious problem that adults should try to stop whenever possible. And nineteen percent of adults said learning how to deal with bullies was part of growing up and that adults should let children handle bullies on their own. The surveying of adults was conducted September 21-23, 2010 through telephone interviews of 1,010 adult Americans. The polling of teens was conducted September 23-26, 2010 through telephone interviews of 500 teens between 12 and 17 years old. The poll was conducted in conjunction with Rosalind Wiseman, author of the book that inspired the movie “Mean Girls.” For adults, the survey has a sampling error of plus or minus three percentage points and for teens the sampling error is plus or minus 4.5 percentage points. 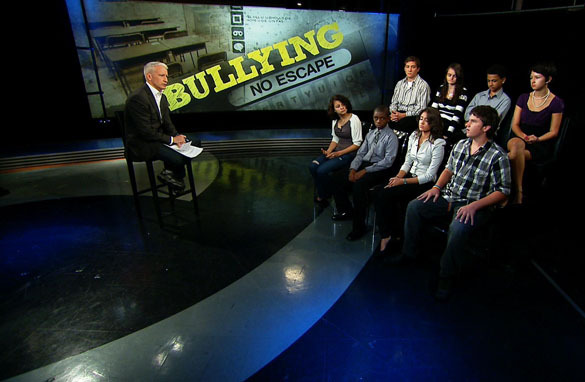 Programming note: Don't miss AC360°’s week-long special report “Bullying: No Escape” beginning Monday at 10 p.m. ET on CNN. America needs to realize that bullying also goes on in the corporate world as well. I am currently a victim of it. Because I recorded my supervisors and managers harrassing me and failing to act when I complained about it. My position was transffered 180 miles away where I could not relocate to so now I've been out of work going on 15 months. So it's not just kids being bullied in our society,bullying goes on more than reported in the work place also. This lays close to my heart as I have two children and I think we need to as a nation come together and stop school bullying. Bullying effects so many people and our childrens future. How do we expect our children to succeed in school, society and life in general if they are bullied at school, they are not learning the tools to succeed in the working force or life in general. We also need to tighten the law on the no bullying rules in the school system and I think we need to have the same rules for the work force as well, it still effects everyone. Please really think about our childrens future, we cannot be a better society if we don't make the changes that need to be changed. I was bullied beginning when I switched grade schools. It continued through high school. I was a "gomer". I didn't have friends and couldn't make them, becuase the entire school treated me as an outcast. Thoughts of suicide were constant on my brain to get away from the pain. I never made an serious attempts. Bullying doesn't have to be about any particular thing about the person being bullied. It was about the bully and the mob mentatlity that he/they created. When college came I cut ties with everyone I knew and became an entirely new and outgoing person. Other than my parents (who helped me through it) and a couple now close college friends, no one (not even my wonderful wife yet) knows of my painful past. I lost a lost of my life during those times. My sister was maliciously bullied in middle school because she was overweight. I felt terrible for her and saw how much she was hurt. As a result, I developed an eating disorder out of fear of being fat. It continued off and on until college. The bullies' victims aren't their only victims. Entire families are hurt. One of the biggest problems today are people like Simon Cowell and Piers Morgan on these talent shows. Kids love American Idol and America's Got Talent. Judges on these shows make bullying fun. They degrade and make fun of contestants, kids love it. These shows intentionally put horrible singers and acts on so these rich men like Cowell and Morgan will have someone to make fun of. Both have gotten rich by degrading contestants, they are heroes to these kids simply because they make it fun to degrade and rip contestants apart. Immature kids take it to their peers and use same method to have fun degrading others like their heroes do. It's a shame tv networks will use any method to get ratings. Immature kids will mimic their heroes no matter how bad their behavior is. I have children elementary school, and have had to let administration know that my kids have been bullied, it amazes how they will stay neutral in those situations. Most schools like to make you think that they will exstingish the situation, but when it comes to actually talking to the bully or their parent they don't reallyl lay down the law. They try to be diplomatic. There for the bullies remain the bullies and the victims remain the bullied. Our school has yard duty staff and my child says that there know help. The problems lie with in the school staff, think about if a unwanted person barges the school grounds they do every thing to pertect the people on the campus( we leave our children in there hands 6 hours a day to educate and to know about there wearabouts) they are responsible!!! Then why do we have to hear about theses bullied children doing harm to themselves, every story , every time you hear the parents of these children say "we told the principal our child was being bullied" well, what happened nothing ! I've seen it my self. And it saddens me!!! I have a NO tolerance policy in my home. My children will NOT bully ever! School staff needs to protect our children when we can't be there . Some teachers don't want to be bothered with keeping the peace in the classrooms. They think they shouldn't have to be babysitters. Parents, teacher, administration must do there job!!!!! And stop looking the other way! TODAY! Bullying has been a problem for many years, I believe schools know but are not sure how to handle the situation. I have two grandsons now 16 and 19 years old who have been victims of bullying. They know they have to be ready to fight back in order for the bullies to eventually stop using them as their battling toys. Telling the teachers only makes them upset because they feel they went to someone who would not help them. I am 63 years old now and I can remember the fights I had during my school years that were the result of someone trying to bully me. I even remember a classmate getting killed years ago because they said he had bullied someone. I believe the many killings at our school campuses was the result of bullying and now we need to take some type of action to stop these abusers, What? I am now sure. My name is Karen Sebben and I am the co-founder of "York Region Anti-Bullying Coalition". This organization is as a result of my son's personal three year battle of being victimized by the same six peers for three school years. There is no legitimate reason for any child be at the receiving end of such heinous behaviour. A study published by the Canadian Journal of Psychology has stated that there is a national epidemic which is adversely affecting the mental health of millions of children, even though lots of people have the power to prevent it. So where are they? After watching CNN at 8:30AM about bullying, I felt I had to respond. The speaker had a lot to say, but did not seem to have experienced the actual act. You cannot plead, or explain consequences. They laugh it off. About 37 years ago, I found out my son was being beaten up every day on the way home from school. He never told me this was going on. I found out from a parent of his friend. I went to the parent of the bully, who were a principal and teacher and was told kids will be kids and not to interfare. After a few more incidents I asked my daughter what I should do. She was in junior high. The next day she got a few foot ball players together and paid the bully a visit. Needless to say he never bothered my son again. Sometimes being a diplomat with teenagers does not work. My son thought he could handle this on his own, but it didnt work. I feel that parents should be held responsible for what their teenage children do.